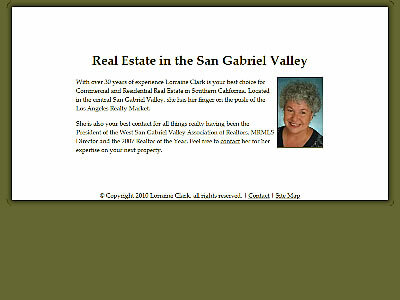 Lorraine Clark has been doing realty for so long I can’t tell you (you might figure out her age). She has made friends with everyone in the San Gabriel Valley and they all come to her house for Christmas (no joke). This site was built in business card style with a nice contact form. If you need a commercial or residential realtor, Lorraine Clark is the right person whether you live in San Marino, San Gabriel, Arcadia, Temple City, Pasadena or anywhere else in Southern California. Update: Lorraine has let this domain expire. She’s still an awesome realtor though.